The latest statistics are hinting that today's motorcyclists are having more single vehicle crashes than collisions with other motorists. But both single vehicle crashes and collisions with other vehicles can often be traced to braking errors. For instance, a motorcyclist crunches his bike into the side of a pickup truck that's emerging from a side street. There is a long black skid mark leading up to the shattered bike and dented truck door. It's tempting to blame the truck driver for failing to yield. But a long straight black skid mark is embarrassing proof that the rider has over-braked on the rear and ignored the front brake. Since it's usually the motorcyclist who gets hurt in a collision, it's in our best interests to brake aggressively when needed without losing control of the bike. While it's tempting to look for better brake technology to avoid human errors, it's important to remember that the rider is a big part of the braking equation. 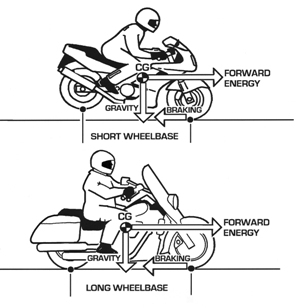 Braking requires both rider awareness and skill. If you don't recognize the hazard and get on the brakes quickly, even the most exotic system can't save you from a crash. And if you fail to use the brakes correctly, you won't bring the bike to a stop in the minimum distance. If you're in the habit of squeezing the front brake lever whenever you need to scrub off speed, you'll just squeeze the lever harder, avoid the problem, and think about it later. On the other hand, if you're in the lazy habit of using only the rear brake, you'll most likely jam on the rear brake and realize after the crash that you didn't reach for the front lever. So, regardless of the braking systems on the bikes you ride, it's important to practice good habits�all the time. Should you always cover the front brake lever, even on a long straight highway with unlimited visibility and no traffic in sight? Hugh "Harry" Hurt, principal investigator of the famous "Hurt Report" suggests an answer: "Well, remember that the majority of motorcycle accidents in the study occurred on straight roads with unlimited visibility, when the rider didn't expect anything to go wrong." Let's also remember that the quickest, shortest stop will be made with both brakes applied to the maximum just short of skidding. That means that if your bike has ABS, you shouldn't be jamming on the levers so hard that ABS is activated. ABS is there to help you avoid a slideout, but ABS activating will lengthen the stop. You'll make a quicker stop if you can apply the brakes just short of ABS activating. If you're in the habit of using the front brake, you're much more likely in an emergency to brake hard now, and think about it afterward. Riding an urban arterial, you anticipate the possibility of a collision, check to be sure you aren't being tailgated, continue to watch for other vehicles ahead that might turn into your path and cover the front brake lever. You observe a dark-colored van ahead that might make a quick left turn, and reduce speed about 10 mph by shifting down a gear and squeezing lightly on the front brake lever. Slowing just 10 mph cuts your braking distance in half, should you need to make a quick stop. left- turning vehicles like that dark van ahead. Apparently the driver doesn't see you, or doesn't realize how close you are, and starts to make a quick turn across your path. 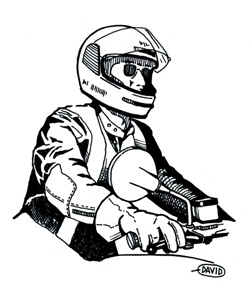 You squeeze the clutch, roll off the throttle and apply both brakes together, pressing lightly on the rear brake pedal and squeezing the front brake lever gradually harder. As the motorcycle pitches forward, you ease up on the rear pedal and squeeze harder on the front lever to the maximum just short of a skid. Even with the left-turner now crossing your path, you keep the bike vertical and pointed straight ahead, with your knees gripping the tank and your eyes focused on the pavement where you intend to stop short of a collision. During the last few feet of the stop, you shift down to first gear, and glance briefly in the mirror to be sure you're not about to be rear-ended. 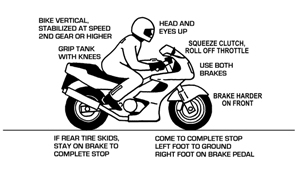 You bring the motorcycle to a stop with your right foot still on the rear brake and your left foot on the ground. Then, as the offending driver moves out of the way, you ease out the clutch and continue down the street. You have turned a potential collision into a minor inconvenience. Since emergency actions follow habits, it's a good idea to practice the right braking habits. Let's think about aggressive quick stops. If you intend to ride fast on public roads, you should be as good at quick stops as you are at cornering. It's important to be able to make a quick slowdown from road speed when you realize the next corner is tighter than you expected, or you realize the curve ahead is coated in loose gravel. 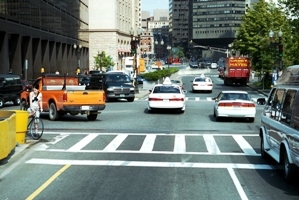 But to avoid collisions in traffic, you may need to brake to a stop from urban traffic speed--typically 35-40 mph. To get quick stops implanted in your habits, it helps to do some braking practice. Riders of machines with ABS, linked or power assisted brakes are not excused from the drill. Find some long, smooth, tractable piece of pavement that you can borrow for an hour or so. An abandoned section of road can do. Or perhaps you have a nearby parking lot that is vacant early on a weekend morning. It helps to set up some cones or markers to define a "braking chute" but all you really need is a long strip of clean, level pavement, and some marker to give you a braking point. If you've never practiced quick stops before, start your first braking runs no faster than 20 mph. Trust us here, no faster than 20mph. If you don't do a perfect stop from 20 mph, keep practicing at that speed until you get it perfect. As you increase skill and confidence you can gradually bump up speed on subsequent passes. Get the machine stabilized at about 18 to 20 mph in second gear. Maintain speed right up to the braking point. Keep your head up and eyes looking forward to where you intend to be stopped. Avoid glancing down at the instruments or levers, or off to the side. When your front wheel reaches the braking point, squeeze the clutch, roll off the throttle and apply both brakes simultaneously. As the weight transfers forward, ease up on the rear brake and squeeze the front lever progressively harder. Stop as quickly as you can without skidding either tire. Practicing straight line quick stops helps you to develop your braking habits, and also gives you confidence that you can brake aggressively without losing control. An impending front tire skid makes the front end push from side to side, and steering will get lighter. If the front tire starts to skid, ease up on the lever to regain traction. If your machine has ABS and you feel the pulse of ABS activation, try slightly less lever pressure on the next run. It's harder to feel when your rear tire is skidding. But, with standard independent brakes, if you should accidentally skid the rear tire, it's best to keep it skidding until the bike comes to a complete stop, to avoid the possibility of a high-side flip. On the next run make a point of using less rear brake. If you can't seem to avoid skidding the rear tire, try stopping with the front brake only. You will discover that the rear tire gets easier to skid as you bump your speeds up, due to the increase in forward energy. That's especially true of short wheelbase bikes. On a bike with a longer wheelbase, the CoG will be farther back from the front wheel. A short wheelbase bike will require greater skill to brake aggressively because the CoG is closer to the front wheel. Toward the end of the stop, remember to shift into first gear. Come to a complete stop with your right foot on the brake pedal and your left foot supporting the machine. The habit of shifting to first prepares you for a quick getaway to avoid a possible rear end collision. With the bike stopped, check the rear view mirror. When practicing, you may want to pause for a few seconds to consider your technique. Did you remember to squeeze the clutch to prevent the engine from stalling? Did you stop with your right foot still on the brake? Did you skid the rear tire? Did the bike wobble from side to side? Did you remember to shift into first gear? Did you stop with your right foot on the brake? There's always the risk of a fall as you are honing your skills. So it's smart to wear all your crash padding, including helmet, armored riding gear, full-fingered leather gloves and tall leather boots.